Here's the big reveal of the completed product - my vintage inspired 50s T-Style guitar. Now before I continue, vintage purists may point out that this is not 100% vintage correct, for example using Gotoh SGS510Z machine heads which I simply find unbeatable in terms of tuning stability. My personal ethos is to build a guitar that looks, feels and plays the best in can. Whilst this is vintage inpsired, not everything is vintage correct, but it certainly looks and sounds the part! Contact me if you’re interested in a custom build. Now time to get learning more country licks! I'm slightly loathed to let you all in on this find, but then that wouldn't be fair to you or to Vaughn Skow, who is winding the most amazing vintage style pickups over in Nashville, Tennessee. Vaughn is, in his own words, a "bona-fied, certified transducer nut!". All of his designs are from the truly golden period of electric guitar design, 1954-1969 and he uses the finest materials available, and (again in his words not mine!) makes the pickups with a "fanatical attention to detail and precision.". I have tried many of his pups are they have all impressed massively (and I've been through a lot of boutique winders in my time). The tone you can get out of them is out of this world. For my personal preferred style and tone he is now my go to guy for pickups. 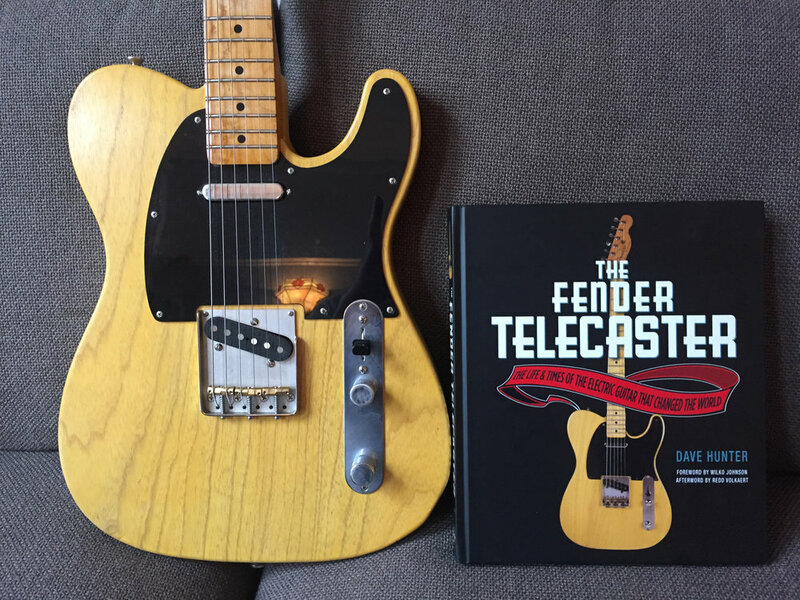 For this vintage inspired build I chose the perfectly suited 1957 Historic Telecaster® Set. For the bridge I've opted for the ash tray style vintage bridge from Callaham with compensated brass saddles. Find out more about Vaughn and his pickups and amps (yes, he makes amps too!) here. 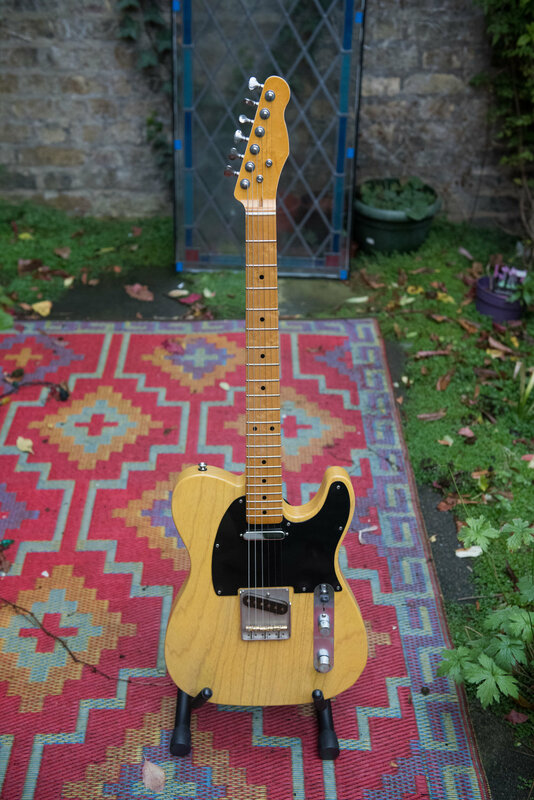 Vintage 50s Style Tele - It's All About The... Neck! This is another fantastic neck from Tommy at USACG. It is a two piece Maple neck (Birdseye Maple on the fretboard with gorgeous figuring) with a medium Clapton style V neck profile. The frets are medium jumbo Nickel, 9.5 radius. Depending on the build, I tend to prefer jumbo frets as to my ear they give more body to the sound and just feel better under the fingers. Although each to their own - I will happily provide you with any spec you desire (within reason!). I used a clear oil from Wudtone (again to preserve resonance) but at the last minute decided that I really wanted to give it some more vintage like, aged colour and so I gave the neck a few light passes with a can of tinted nitro. Again the unfinished neck came from my friends at USA Custom Guitars; Birdseye maple for the fingerboard and plain maple for the main part of the neck. My next post will be on the pups and bridge I've chosen. I can't wait to spread the word on a new pickup winder I've discovered over in Nashville...! But you'll have to... only until my next update on this build though! The mission for this build was to get close to a nice old 50s Black-guard Telecaster. I wanted to create something as close to the original classic as possible, but I wasn't going to let using a few modern parts here and there hold me back! That said the plan was definitely to go further than ball park approximation - the best quality parts I know of are being used for this build. The body I had custom made is Swamp Ash (light weight) from USACG. Most of my builds use necks and bodies from Tommy Rosamond at USACG. Tommy always has the time of day to talk through every detail and puts up with this limey's numerous questions and requests! The tone and quality of these parts are absolutely key build foundations and are just stellar. I would do a tone and all round quality challenge with certain "custom shop" guitars any day of the week, with confidence. 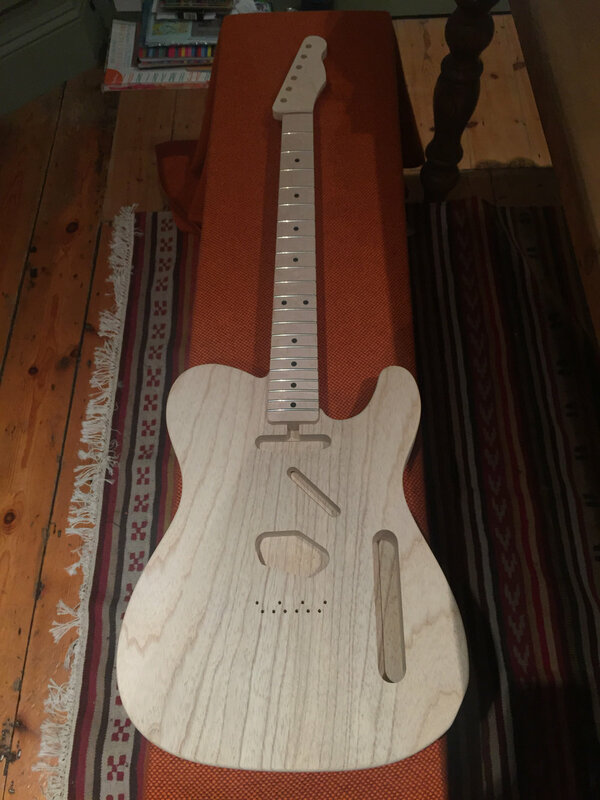 I chose an oil finish for the body - somewhat controversial and definitely one element that is not completely aligned to a 50s Tele. Let me try and explain why! An oil finish (in this case from Wudtone) gives you a thin protective finish that simply allows more resonance and is perfect to encourage that Tele twang. No grain filler is used so you do get a very different, more organic look to the finish, which I personally love for certain guitars. This approach really is considered the opposite to large companies slathering on a thick coating of Polyurethane, which can smother tone and sustain. I only had to use a few coats of colour to get to the lovely golden butterscotch you can see to the right. For the oil finish you only have to wait overnight for each coat to cure, which is also an added bonus! To top it off I added a clear gloss oil to get a lovely sheen. I used and mixed a combination of Olympic Girl White and Goldenrod Yellow oils to get this particular yellow, matching to early 50s Tele body colours. The top coat was clear gloss. That's it for now. Keep on eye out for my next blog post which will be a short piece on the neck! A quick video demonstrating the oil finish in action on my latest build (and showing off my shed! ).